If you have a child like mine they seem to want to watch the same tv shows and movies over and over. Its nice in the beginning when they find a new show they like and you can watch different episodes but when its the same movie over and over it becomes quite boring for the adult. I am always trying to slip in a new movie to see if she will give it a chance and usually she will want her favourite back on. 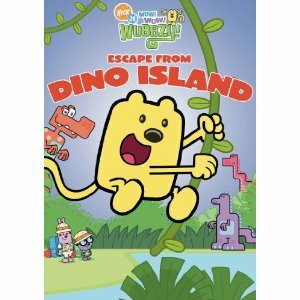 I didn’t know how Sadie would react to Escape From Dino Island but I was ready for something different. We had never watched any Wubbzy shows before and to my surprise both Sadie and I really enjoyed it. The whole DVD is about 80 minutes and includes 6 episodes plus bonus features such as a Photo Gallery, Coloring and Activity Sheets, Sneak Peeks and a Bonus Episode. We enjoyed watching the Wuzzleburg Gang go on their many adventures and listening to them sing along the way. Sadie and I both enjoy DVD’s that include songs to sing along too. And the good part is your child will learn little life lessons along the way about honesty, sharing and all the good stuff parents want to teach there children. The bright crisp pictures held her attention and although she didn’t sit through the entire thing she will ask for it or I can suggest watching Wubbzy and she will agree. To see more fun activities and join the Wubb Club, visit Wubbzy and the Gang at www.wubbzy.com. I would love to have the “Wubbzy Goes Green” DVD! I subscribe via email also! I think I would like one of the Wubzy books. I am always looking for new books to read at bedtime.